These days there is a lot to read on Cloud and Cloud Computing. I have a written few blogs on these same topics. In the frenzy of cloud computing (I do admit that the potential of cloud computing excites me very much), what do you think will happen to ERPs? I have had many discussions on the topic. It’s an ongoing debate with customers and system integrators alike. So I’d like to discuss my point of view here on my blog– and I certainly welcome your comments and feedback. I recently visited museums in India. One of the museums featured India’s Industrial Revolution. It showcased how the country evolved as a spice exporter to a cotton producer and to a technology exporter. It’s an interesting history for sure. Now India is recognized for its technology knowledge base. The museum reminded me of one big fact. Still today, and most people don’t realize this, IT Services is less than 5% of India’s GDP. Agriculture followed by Services and Manufacturing continues to be the major portion of the Indian economy. Why is it important in this context? In today’s IT world, most magazines are full of cloud articles, blogs, presentations, conferences etc. In reality, according to some estimates, ERP Cloud applications (full or partial functionality) are ~$2 Billion. The total market size is over $150 Billion. If you include Supply Chain Management in the equation, the global market for ERP is even bigger. Contrast this with the adoption rate of Cloud Services for Email and Office tools. It is projected that Cloud will account for 40% market share in the next couple of years. Why is this contrast between ERP adoption and other Cloud software? 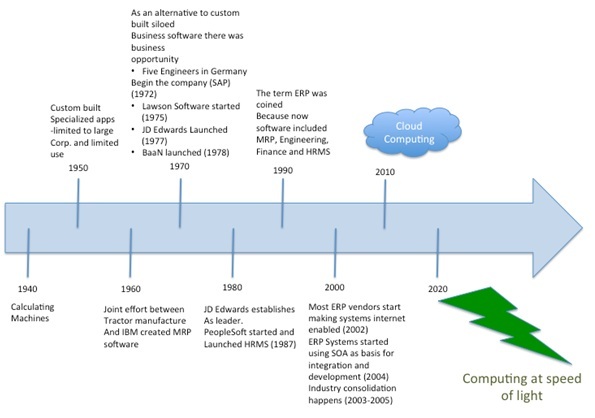 Let’s trace the brief history of ERP (enterprise resource planning). There is a short article published in the Journal of Operations Management. I have tried to summarize it to jog our memories on why ERPs came about. In the early 1940s companies started using the calculating machine to automate some functions. When IBM started marketing mainframe machines for organizations, operators saw the value of the technology and some large organization stared to invest in it. Mainframes were used for specific functions and needed a lot of support and they created silos within organizations. For instance, there was a job to calculate payroll, there was a job to compute totals to be included in the financial book-keeping, but the two jobs didn’t necessarily talk to each other so humans had to intervene and made them match. This matching of jobs, however, caused inefficiency in operations as well as gross inaccuracies in reporting. Then someone thought it would be great idea to have systems talk to each other and automate some of these tasks. This started more specifically with Material Resource Planning (MRP) applications. This integration of business operations soon showed a benefit and then further “consumerization” of Information Technology allowed other companies (large and midsize) to start adopting it. Then companies like Intuit and NetSuite started to focus on small business to offer a similar benefit. Companies started to spend a substantive effort and resources to implement these business applications and standardized business processes. Salesforce and NetSuite changed the paradigm on how companies license the software. In early 2000, the Service Oriented Architecture (SOA) concept came about mainly to address the biggest issue with ERP. No single ERP could satisfy corporate requirements and it cost too much to integrate and keep systems fresh. SOA got a lot of press and was the talk of the town, but it never took off until just recently and (not surprisingly) it took off just after most large ERP vendors started supporting SOA natively. Now, Cloud is the talk of the town. There is an increasing adoption of cloud services when it comes to infrastructure, but it’s still in its infancy. There is lot to learn. As it pertains to enterprise applications, there are many roadblocks. There is very little adoption of Cloud applications when it comes to enterprise business. The main reason for this lies in the history of ERP and how ERPs came about. ERP vendors like Oracle and SAP have plans to offer an ERP suite in the Cloud, but they are not in any hurry to do so for obvious reasons. There are niche players that offer specific applications where ERPs have gaps like Workday, RightNow, etc. Integrating these individual applications into ERP is still an organization’s responsibility. Enterprises, however, will never go back to 1960-1970 where they have “siloed” applications and as a result still struggle to integrate them. Cloud applications make business sense for those organizations that are not in the business of IT. Companies have been trying to set this up via outsourcing for some time, but it’s never actually relieved them of the burden of managing IT software and infrastructure. Cloud offers that promise. There is an opportunity for the System Integrator here to provide a platform that will give choices to the customer and allow them to integrate the various cloud applications from one or more vendors without organizations having to care about it. Both Cloud vendors and System Integrators need to figure this out together. If Cloud adoption is to really reach the enterprise in a meaningful way (outside of communication and messaging), this integration issue must be addressed. There needs to be a framework that can support integration of various platforms, technologies and applications with central management processes. It needs to be easy to understand and has to be secure. For now, most organizations are still continuing to rely on ERPs. However, ERP vendors are now preparing for new ERP packages with a “Cloud” model by revamping their applications and licensing models to provide this option to their customers. ERPs are very much alive and will be here for some time to come. How it’s delivered to the customer will definitely change and System Integrators will have to play big role in the adoption of a Cloud model for ERPs. This warrants a separate blog to discuss the role of System Integrators in our new Cloud economy. For now ERP is here to stay in some form and the role of System Integrator will still be a critical necessity for some time to come. Open-source software: a viable option for non-tech companies? Lesson learned from Healtcare.gov – Open Source or not to Open Source?